Strange as it might seem, until writing this review I had never heard Kathleen Ferrier sing. I had read about her extraordinary contralto voice but nothing had prepared me for what it actually sounded like until, on 22 April 2012, BBC Four repeated the documentary An Ordinary Diva, as a celebration of Ferrier’s 100th birthday. Given this reviewing assignment I thought it would be a good idea to watch the film. I am extremely happy that I did, as Ferrier’s legendary voice was a complete and welcome surprise to me. She sounded moving, lyrical, harmonious, dramatically expressive, all at the same time but most of all, irresistibly warm. It triggered my immediate interest in this book and later, to look for one or two of her most famous recordings. Dr Christopher Fifield is a distinguished conductor, writer and broadcaster. He has contributed to many important works on music and published the biographies of Max Bruch and Hans Richter (1993). To the general music-loving public, he is perhaps best known for his concert intermission talks during the Proms or for his work with the Lambeth Orchestra of which he is the current musical director. The present book, Letters and Diaries of Kathleen Ferrier, is actually a revised and enlarged edition of the one previously published in 2003. 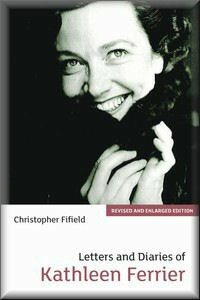 I presume that Dr Fifield, like the BBC with the film mentioned above, decided on producing this new edition to celebrate what would have been Kathleen Ferrier’s 100th birthday on 22 April 2012. The book is divided in two major sections: the first featuring Ferrier’s letters and the second, her diaries, all ordered chronologically. The presentation of both letters and diaries is clear. I particularly enjoyed Dr Fifield’s introductions both to the letters and the diaries. He writes in a concise, factual and informative style, which gives the reader important clues in understanding Ferrier’s letters and diaries, as well as additional aspects of her life that are not obvious from the letters and diaries. Ferrier’s letters are extremely enjoyable and fascinating to read. As I progressed through them, I was often reminded of Mozart’s letters. Like the great composer’s, her letters reveal a warm, bubbly personality. The Kathleen Ferrier loved by friends, peers and public alike emerges through what she wrote, as somebody who loved life, who was kind, warm, genuine and with an innocent, spontaneous humour, almost child-like, in its charming and simple directness. Ferrier was a great singer but she appeared to have been an even greater human being. From a historical point of view, her letters are also fascinating, as they offer modern readers a real account of what life was like in Britain during the war and the post-war years. For this fact alone, it would be worth reading them but, more than being documents of historical value, her letters are fun, lively and wonderfully entertaining. They also give a good insight on how seriously she took her singing career and how she revelled in it. The woman that emerges from the letters is a lady with a big heart, a serious professional and ultimately courageous in the face of the cancer that undermined her and eventually killed her long before her time, in 1953, at the age of only 41. The second part of the book comprises Ferrier’s diaries. While the ones for 1942 and 1943 are full of her comments on things she saw or brief accounts of things she did, the others, apart from giving a good insight on how busy her life was and how methodical and organised she appeared to be, I must say, I found them a little tiresome, as they are really endless lists of appointments, rehearsals, people she was going to see, and so on. Reading the diaries, especially the ones for 1942 and 1943, I could not help but think that had Ferrier been alive today, she would probably be an enthusiastic user of Facebook and Twitter, as her comments often resemble the kind of thing one sees on these social networks. After the diaries, Dr Fifield included a good selection of Tributes to Kathleen Ferrier, as well as two appendices with further letters (13 in total) that came to light quite late when he was already finalising his book. Finally, I should mention the illustrations, which are charming black and white photographs of Kathleen Ferrier on her own, with friends, rehearsing or performing. All have one thing in common: a beautifully warm smile, which even as I admired the pictures, gave me the urge to smile back, making me grasp perhaps the full impact of her personality and how she conquered audiences, composers and other musicians alike. This book is definitely a loving, worthy tribute to a great artist. Fifield’s admiration for Ferrier is transparent, as is the wish to make her known to modern music-lovers who are too young to have listened to her live or experienced her performances. If these were Dr Fifield’s objectives; then, he has certainly met them. Additionally, it may motivate the reader to buy some of Ferrier’s recordings, which together with her letters, will certainly paint a colourful, human and charming portrait of an amazing singer and a wonderful woman. I enjoyed this book immensely and although it is not a “page-turner” in the normal sense of the term, Ferrier’s letters are compulsory, fascinating reading and like Mozart’s, I couldn’t put them down!